Have you ever been in the situation where you're stuck in the sun, are hungry and thirsty and just want to give up and go home? Yeh, me too. Fear not! Next time you can help yourself with two breathing exercises out of the ancient yoga pranayama tool box, that cool your body temperature right down, but also reduce hunger and thirst and beat fatigue. The names of these miracle workers? Sitali and Sitkari. Usually they are practiced in summer time. But not exclusively. Also after a vigorous yoga practice or workout, if you are suffering from hot flushes or from a fever – Sitali and Sitkari can be real savers. Read on for the easy to follow technique. First in line, Sitali. Also called tongue hissing breath. The work sita in Sanskrit means cooling, soothing. Sit comfortably in a meditation pose or stand upright when out and about, most importantly keep a straight spine. Form an O-shape with your lips. Now curl the tongue up on the sides, creating a small tunnel for the air to pass through. Slightly stick out your tongue, with lips closing in around it. Take a deep and forceful breath in through your mouth, then exhale through your nose. Inhale again through your mouth, exhale through the nose. Repeat these in- and exhales for two to three minutes, with more practice you can gradually increase the time up to ten minutes. Do you have trouble curling up your tongue or feel uncomfortable doing so? Try Sitkari. Sitkari, the teeth hissing breath. Sitkari also comes from Sanskrit and means hissing. You softly clench your teeth and slightly open you lips. When ready, take a deep inhale through your mouth and your teeth, while making a hissing noise. It should sound a bit wet, just like the sound the suction pump makes at the dentist. I know, not a nice picture, but it helps conveying the idea. When you’re ready, exhale through your nose, same as with Sitali. Repeat this breath up to 20 times. So how do these two breathing exercises cool down our bodies? When we inhale through the mouth, the air gets moistened before it enters our bodies, plus it doesn’t get warmed up, which happens when passing air through our nose. These two factors combined create the cooling effect. That sounds too good to be true! Any risks or downsides? Try to practice these techniques neither in places where the air is too hot, nor in cold weather (winter). This is due to the fact that when inhaling through your mouth the air goes straight into your lungs, keeping the same temperature as the outside environment. So if you breath in cold or very hot air through your mouth, it might have a negative effect on your lungs. Unlike with inhales through the nose: Air always gets warmed up before reaching your lungs. 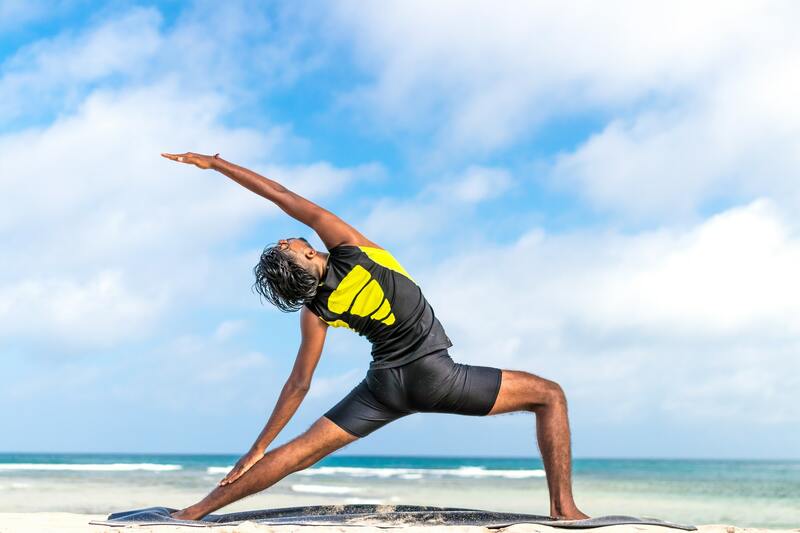 It’s worth mentioning that Sitali and Sitkari are the only yogic breathing techniques that have a cooling effect on our body, as all the other yogic breathing exercises warm our bodies up. They are popular breathing exercises in Kundalini yoga, but are also practiced in other yoga classes on hot summer days. Also in Ayurveda Sitali and Sitkari are recommended to balance a predominant Pitta Dosha, which are bodies that have too much fire. Let’s try one of the two cooling breaths next time you feel hot, it works miracles! It’s not a miracle however. It’s only yoga, doing it’s thing.